This Lemon and Herb Orzo Salad With Roasted Zucchini is full of refreshing flavors like lemon, dill, basil, and parsley. Perfect for summer dinners or potlucks! The best Sundays involve puttering around in comfy clothes with coffee and cracking open a book; maybe getting some housework done to leave myself with a fresh environment for the new week ahead. An added bonus to all of this is cooking a dinner all low and slow to fill your home with the aroma of something damn good that you just can’t wait to dig into later. That’s exactly what this past Sunday entailed. I threw some gloriously saucy ribs in the oven, baked them on low all afternoon, and enjoyed some reading in between tidying up. Our usual dinner side is a roasted veg of some sort—usually this oven-roasted broccoli with nutritional yeast. (We just can’t get tired of that one.) But! I really wanted our messy fall-off-the-bone ribs to be accompanied by something that celebrated the warmer weather we’ve been having—like a cold and hearty salad full of tasty goodies. After all, at 70º F, I knew we’d be feasting out on the deck. Might as well do it right! Lemon and Herb Orzo Salad With Roasted Zucchini. The flavor profile in this recipe is simple in a most welcoming way. Freshly squeezed lemon plus a collection of fresh herbs equate to an invigorating mouthful. And if you’re a gardener, you can easily use your own harvest, which is always fulfilling. This is definitely a salad you’ll want to make several times throughout the summer whether you’re throwing it down as a side dish or bringing it to a potluck. And! Because the flavors are so simple, it could pair with just about anything—like this garlic butter steak stir-fry or this Greek grilled chicken. >> I am currently *obsessed* with this Instagram feed. If you’re a sucker for pastels and perfectly smooth royally-iced sugar cookies, check it out. Scrolling through that feed is so soothing. Let me if you check it out! >> I’ve been cleaning my house with Aunt Fannie’s products and am loving them so far. Environmentally friendly, non toxic, and no harsh ingredients. >> This year my goal has been to drastically minimize my use of plastic. It started with remembering to haul my collection of reusable grocery bags whenever I went shopping. Then, I replaced plastic baggies with these handy silicone bags (I’ll be hosting a giveaway for them on Instagram soon, so keep your eyes peeled). Finally, I ordered myself some of these mesh produce bags. Bit by bit! If you try this recipe or create your own variation, let me know in the comments! I love connecting with you. Then snap a photo and tag me on the Insta @killing__thyme to be featured in our newsletter. Place diced zucchini into a large bowl. Drizzle with 1/2 TBSP of olive oil and sprinkle with some salt and pepper. Toss to coat, then spread the zucchini over a baking sheet. Bake until tender—about 8-10 minutes. Once the zucchini is done, remove it from the oven and set aside. Cook the orzo as per the directions on the package (no longer than al dente). When it's ready, drain the orzo and run it under cool water, tossing it lightly with your fingers to get that starchiness out. Give the orzo a good shake in the strainer to remove excess water, and transfer the orzo to a large serving bowl; set aside. Zest your lemons before juicing them, and transfer the zest to a blender. Add the lemon juice followed by all of the other ingredients for the dressing to the blender. Blend until all of the ingredients are thoroughly mixed and pureed into a dressing. Give it a taste test and season further if needed. 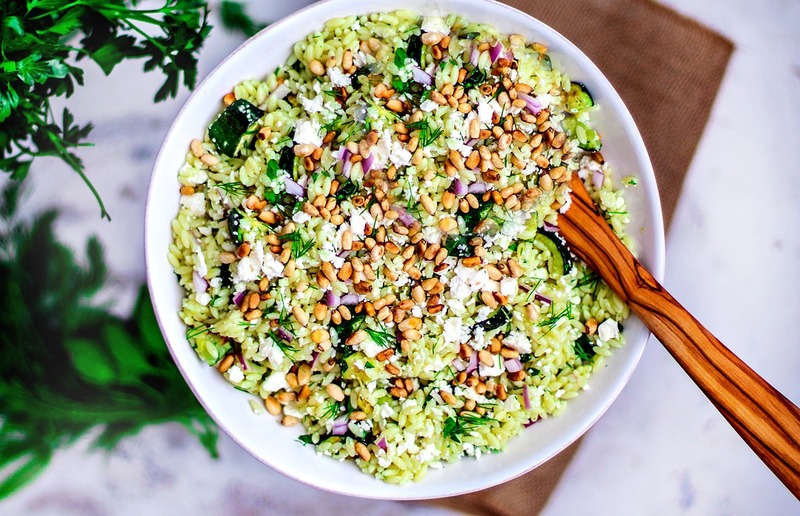 Finally, toss the roasted zucchini in with the orzo, followed by 1/2 cup chopped red onion, 4 oz of crumbled feta, 1/3 cup toasted pine nuts, and some extra chopped fresh herbs. Give everything a toss and serve, or place it in the fridge until serving time. The salad and any leftover dressing will last in the fridge for 3-5 days. To toast the pine nuts, dump them into a dry pan and place over medium-low heat. Shake the pan often to prevent burning, and let the nuts heat up until they're golden brown and aromatic. This should only take about 5 minutes. If you don't want to splurge on pine nuts (they tend to be on the pricier side), feel free to use chopped walnuts or slivered almonds. You can toast the the same way as noted above. *Cook time is noted as 20 minutes, but it you cook the zucchini and the orzo at the same time, it should be less. *If you're vegetarian and don't eat cheeses made with animal rennet, omit the feta or find a feta that is veg friendly. Dana, this recipe is PERFECTION. I'm always craving lemon and herbs this time of year AND I just bought myself a bag of pine nuts on a whim at TJs. I'll definitely be trying this one out for all the dinners we are going to have on our deck at our new house! Ohh...love all the fresh herbs in this dressing. Sounds light and refreshing. A great idea for when we have too much zucchini in the summer garden. Something different for a change. YUM. I can see how this would be the perfect side to some saucy ribs! I've never cooked orzo but I love the lemon herb combo, so I'll definitely be giving this one a try. And your Sunday sounds lovely! Hoping to have a day like that soon! Ah! I have never worked with Orzo; I must try this it looks like can very well be my weekday lunch or a part of the dinner party or potluck element. I am adding to try list. Love the fresh herbs and the lemony flavors for the spring. Love all the vibrant herbs you've put into the dressing. It's a great way to add some punch to the orzo and the zucchini in a nice and healthy way. I totally hear you on the ol' quiet Sunday cleaning sessions. As boring as it will inevitably make me sound, I miss those kinds of days. With three kids it can be hard to dedicate whole days to that kind of thing, and you really find yourself craving the feeling you get from tackling a bunch of stuff and finishing up with a nice, slow, weekend dinner. I think I'll just have to work a bit hard to carve out some time in the future! This salad would go so good with those fall-off-the-bone ribs which are my very favorites. That Lemon herb dressing sounds amazing and I would love to drizzle it over a grilled lamb chop too. I'm trying to reduce my plastic use too and will be watching your IG for the giveaway! This sounds the best way to celebrate spring - and the weather warming up enough the eat on the patio! I love all of the fresh herbs in this. It makes me anxious to get my herbs planted for the year so I can use them in delicious dishes like this. Fresh dill in particular always calls for spring dishes! This is one of those salads that I could make a meal out of. Love all the flavours here. Orzo is so great to work with. Love the roasted zucchini, I have a bunch I need to use up. In fact, I have all the ingredients to make this.